Yes Open Word is back with 2 dates and loads of fun. coming up this weekend at Arundels. It’s our first event in a garden. Bring picnic blankets, chairs and lots of poetry. We will be having an open Mic so looking forward to your poems. Paul is a poet and versatile writer based in Bournemouth. Published work includes two poetry collections, and non-fiction works on spirituality, leadership and communication. Recent poems have featured on Yellow Buses and in the PR for an aid convoy to Aleppo. He broadcasts regularly on BBC Radio 2 and other stations and performs poetry at festivals and venues in the UK and abroad. Steve is unique amongst performers in the Folk genre in that he has never, ever been even nominated for any award of any kind. 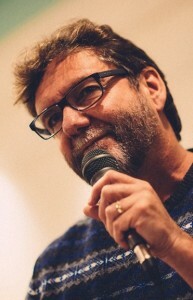 He remains unconcerned by this, as awards for performing arts seem to him to be, “Comparing Chalk and Cheese and then giving the prize to an Avocado.” Hailing from Poole in Dorset, Steve is a multi-instrumentalist and vocalist with his own take on Traditional, Folk and Acoustic music. Playing Fiddle, Bouzouki, Low Whistles, Bodhrán and to everyone’s surprise (including his) Double Bass and Bass Guitar, he has worked over the past 20 or so years in a number of groups across the UK and Europe with wide ranging musical appeal as well as giving solo performances. Appearing on a discography of five album and one EP release, Steve can go from lively in-yer-face frontman to sensitive accompanist at will and anything in between. Dave reading from one of his books. David is a regular at Teapoets and other open Mic around the South East. 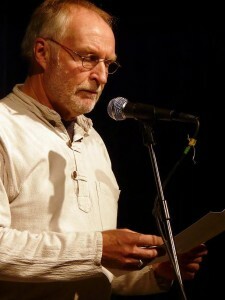 He has been guest at many open mic’s around the South East England David’s poetry has a strong connection to our world and his poetry helps us relate to our earth and ourselves in new ways. The Travelling Bookstall will be available along with books by the performers and MC.